I hate to disillusion anyone but I lack hard rules about what qualifies as a mathematically-themed comic strip. During a slow week, more marginal stuff makes it. This past week was going slow enough that I tagged Wednesday’s Quincy rerun, from March of 1979 for possible inclusion. And all it does is mention that Quincy’s got a mathematics test due. Fortunately for me the week picked up a little. It cheats me of an excuse to point out Ted Shearer’s art style to people, but that’s not really my blog’s business. Also it may not surprise you but since I’ve decided I need to include GoComics images I’ve gotten more restrictive. Somehow the bit of work it takes to think of a caption and to describe the text and images of a comic strip feel like that much extra work. Roy Schneider’s The Humble Stumble for the 13th of May is a logic/geometry puzzle. Is it relevant enough for here? Well, I spent some time working it out. And some time wondering about implicit instructions. Like, if the challenge is to have exactly four equally-sized boxes after two toothpicks are moved, can we have extra stuff? Can we put a toothpick where it’s just a stray edge, part of no particular shape? I can’t speak to how long you stay interested in this sort of puzzle. But you can have some good fun rules-lawyering it. Roy Schneider’s The Humble Stumble rerun for the 13th of May, 2018. This originally ran the 18th of August, 2006, but I wasn’t doing mathematics blogs back then. Also, Molly there is me with any mathematics puzzle, which is why I panic whenever someone brings one to me. This is a new tag for the comic strip. 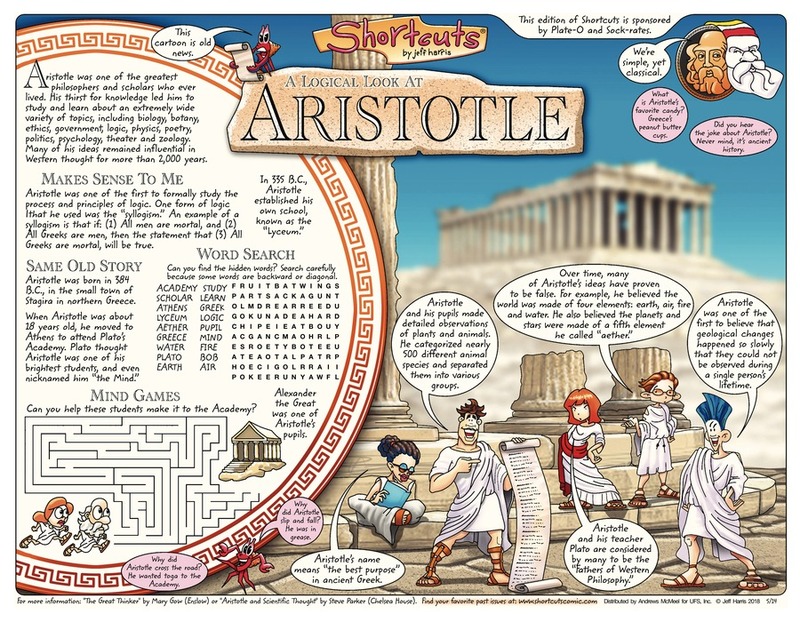 Jeff Harris’s Shortcuts for the 13th is a children’s informational feature about Aristotle. Aristotle is renowned for his mathematical accomplishments by many people who’ve got him mixed up with Archimedes. Aristotle it’s harder to say much about. He did write great texts that pop-science writers credit as giving us the great ideas about nature and physics and chemistry that the Enlightenment was able to correct in only about 175 years of trying. His mathematics is harder to summarize though. We can say certainly that he knew some mathematics. And that he encouraged thinking of subjects as built on logical deductions from axioms and definitions. So there is that influence. Jeff Harris’s Shortcuts for the 13th of May, 2018. That demonstration of Aristotle’s syllogisms is the same one I see when I search DuckDuckGo for ‘aristotle mathematics’ so it must come right from his texts that I’ve never read! That’s how citations work, right? Dan Thompson’s Brevity for the 15th is a pun, built on the bell curve. This is also known as the Gaussian distribution or the normal distribution. It turns up everywhere. If you plot how likely a particular value is to turn up, you get a shape that looks like a slightly melted bell. In principle the bell curve stretches out infinitely far. In practice, the curve turns into a horizontal line so close to zero you can’t see the difference once you’re not-too-far away from the peak. Dan Thompson’s Brevity for the 15th of May, 2018. I am curious whether there’s any significance to Thompson’s uniforms, particularly the player having a ‘B’ camp and a ‘U’ shoulder patch. I don’t think there’s an obvious relevance to the statistics jokes being made. Jason Chatfield’s Ginger Meggs for the 16th I assume takes place in a mathematics class. I’m assuming the question is adding together four two-digit numbers. But “what are 26, 24, 33, and 32” seems like it should be open to other interpretations. Perhaps Mr Canehard was asking for some class of numbers those all fit into. Integers, obviously. Counting numbers. Compound numbers rather than primes. I keep wanting to say there’s something deeper, like they’re all multiples of three (or something) but they aren’t. They haven’t got any factors other than 1 in common. I mention this because I’d love to figure out what interesting commonality those numbers have and which I’m overlooking. Jason Chatfield’s Ginger Meggs for the 16th of May, 2018. Little surprised Ginger didn’t name cricketeers with those uniform numbers, trusting that cricket players have uniform numbers. Ed Stein’s Freshly Squeezed for the 17th is a story problem strip. Bit of a passive-aggressive one, in-universe. But I understand why it would be formed like that. The problem’s incomplete, as stated. There could be some fun in figuring out what extra bits of information one would need to give an answer. This is another new-tagged comic. Ed Stein’s Freshly Squeezed rerun for the 17th of May, 2018. This originally ran the 5th of May, 2011 and maybe I even featured it then. … No, it doesn’t look like I did. Well, I can only imagine how very well this appeal to the parents of the school district under guise of homework went over! Henry Scarpelli and Craig Boldman’s Archie for the 19th name-drops calculus, credibly, as something high schoolers would be amazed to see one of their own do in their heads. There’s not anything on the blackboard that’s iconically calculus, it happens. Dilton’s writing out a polynomial, more or less, and that’s a fit subject for high school calculus. They’re good examples on which to learn differentiation and integration. They’re a little more complicated than straight lines, but not too weird or abstract. And they follow nice, easy-to-summarize rules. But they turn up in high school algebra too, and can fit into geometry easily. Or any subject, really, as remember, everything is polynomials. Henry Scarpelli and Craig Boldman’s Archie rerun for the 19th of May, 2018. And yeah, C^2 + x + 1) isn’t really a coherent expression. It’s either missing a ( mark or, if the C is the open-parentheses, then it’s got nothing-in-particular squared. Also I am so bothered to have close-parentheses and open-parentheses out of order that last sentence. You have no idea. Mark Anderson’s Andertoons for the 19th is Mark Anderson’s Andertoons for the week. Glad that it’s there. Let me explain why it is proper construction of a joke that a Fibonacci Division might be represented with a spiral. Fibonacci’s the name we give to Leonardo of Pisa, who lived in the first half of the 13th century. He’s most important for explaining to the western world why these Hindu-Arabic numerals were worth learning. But his pop-cultural presence owes to the Fibonacci Sequence, the sequence of numbers 1, 1, 2, 3, 5, 8, and so on. Each number’s the sum of the two before it. And this connects to the Golden Ratio, one of pop mathematics’ most popular humbugs. As the terms get bigger and bigger, the ratio between a term and the one before it gets really close to the Golden Ratio, a bit over 1.618. Mark Anderson’s Andertoons for the 19th of May, 2018. I wonder which direction it’s moving in. So. Draw a quarter-circle that connects the opposite corners of a 1×1 square. Connect that to a quarter-circle that connects opposite corners of a 2×2 square. Connect that to a quarter-circle connecting opposite corners of a 3×3 square. And a 5×5 square, and an 8×8 square, and a 13×13 square, and a 21×21 square, and so on. Yes, there are ambiguities in the way I’ve described this. I’ve tried explaining how to do things just right. It makes a heap of boring words and I’m trying to reduce how many of those I write. But if you do it the way I want, guess what shape you have? 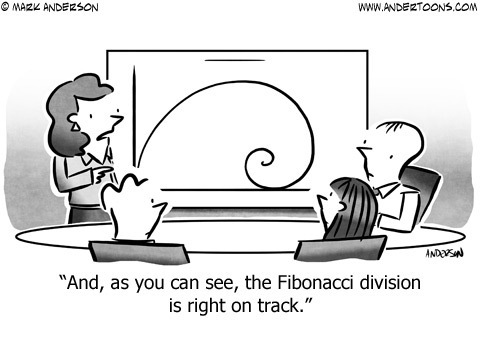 And that is why this is a correctly-formed joke about the Fibonacci Division. Lansing got some record-breaking rain this week. Tuesday we got over two inches of rain, doubling the hundred-plus-year-old previous record. I mention because it got me to wondering how often we should expect records to break. I mean if the thing being measured probably isn’t changing. So my inspiration is out, as there’s no serious question about the climate changing. Measures of sports performance are also no good. But we can imagine there’s something with an underlying property that isn’t changing. So if you keep getting samples of some independent, normally-distributed property in, how often should you expect to go between record-setting values? New records should start pretty thick on the ground. The first value is necessarily both a new high and low. The second is either a high or a low. The third seems to have a good chance of being a new extreme. Fourth, too. But somewhere along the way extremes should get rarer. Even if the 10,000th sample recorded is a new record high or low, what are the odds the 10,001st is? The 10,010th? Haven’t got an answer offhand, although it’s surely available. Just mulling over how to attack the problem before I do what I always do and write a Matlab program to do a bunch of simulations. Easier than thinking. But I’ll leave the problem out for someone needing the challenge. It’s been a relatively sleepy week from Comic Strip Master Command. Fortunately, Mark Anderson is always there to save me. In the Andertoons department for the 17th of January, Mark Anderson gives us a rounding joke. It amuses me and reminds me of the strip about rounding up the 196 cows to 200 (or whatever it was). But one of the commenters was right: 800 would be an even rounder number. If the teacher’s sharp he thought of that next. Andertoons is back the 21st of January, with a clash-of-media-expectations style joke. Since there’s not much to say of that, I am drawn to wondering what the teacher was getting to with this diagram. The obvious-to-me thing to talk about two lines intersecting would be which sets of angles are equal to one another, and how to prove it. But to talk about that easily requires giving names to the diagram. Giving the intersection point the name Q is a good start, and P and R are good names for the lines. But without points on the lines identified, and named, it’s hard to talk about any of the four angles there. If the lesson isn’t about angles, if it’s just about the lines and their one point of intersection, then what’s being addressed? Of course other points, and labels, could be added later. But I’m curious if there’s an obvious and sensible lesson to be given just from this starting point. If you have one, write in and let me know, please. Ted Shearer’s Quincy for the 19th of January (originally the 4th of November, 1976). Ted Shearer’s Quincy for the 19th of January (originally the 4th of November, 1976) sees a loss of faith in the Law of Averages. We all sympathize. There are several different ways to state the Law of Averages. These different forms get at the same idea: on average, things are average. More, if we go through a stretch when things are not average, then, we shouldn’t expect that to continue. Things should be closer to average next time. For example. Let’s suppose in a typical week Quincy’s teacher calls on him ten times, and he’s got a 50-50 chance of knowing the answer for each question. So normally he’s right five times. If he had a lousy week in which he knew the right answer just once, yes, that’s dismal-feeling. We can be confident that next week, though, he’s likely to put in a better performance. That doesn’t mean he’s due for a good stretch, though. He’s as likely next week to get three questions right as he is to get eight right. Eight feels fantastic. But three is only a bit less dismal-feeling than one. The Gambler’s Fallacy, which is one of those things everyone wishes to believe in when they feel they’re due, is that eight right answers should be more likely than three. After all, that’ll make his two-week average closer to normal. But if Quincy’s as likely to get any question right or wrong, regardless of what came before, then he can’t be more likely to get eight right than to get three right. All we can say is he’s more likely to get three or eight right than he is to get one (or nine) right the next week. He’d better study. Tom Toles’s Randolph Itch, 2 am for the 19th of January (a rerun from the 18th of April, 2000) has got almost no mathematical content. But it’s funny, so, here. The tag also mentions Max Planck, one of the founders of quantum mechanics. He developed the idea that there was a smallest possible change in energy as a way to make the mathematics of black-body radiation work out. A black-body is just what it sounds like: get something that absorbs all light cast on it, and shine light on it. The thing will heat up. This is expressed by radiating light back out into the world. And if it doesn’t give you that chill of wonder to consider that a perfectly black thing will glow, then I don’t think you’ve pondered that quite enough. Mark Pett’s Mister Lowe for the 21st of January (a rerun from the 18th of January, 2001) is a kid-resisting-the-word-problem joke. It’s meant to be a joke about Quentin overthinking the situation until he gets the wrong answer. Were this not a standardized test, though, I’d agree with Quentin. The given answers suppose that Tommy and Suzie are always going to have the same number of apples. But is inferring that a fair thing to expect from the test-takers? Why couldn’t Suzie get four more apples and Tommy none? Probably the assumption that Tommy and Suzie get the same number of apples was left out because Pett had to get the whole question in within one panel. And I may be overthinking it no less than Quentin is. I can’t help doing that. I do like that the confounding answers make sense: I can understand exactly why someone making a mistake would make those. Coming up with plausible wrong answers for a multiple-choice test is no less difficult in mathematics than it is in other fields. It might be harder. It takes effort to remember the ways a student might plausibly misunderstand what to do. Test-writing is no less a craft than is test-taking. My little question about just how big a number was got answered just exactly right by John Friedrich, so if you wondered about how I could say a number took about seven million digits just to write out, there’s your answer. Friedrich gives it as a number with 6,846,169 digits, and I agree. Better, the calculator I found which was able to handle this (MatCalcLite, a free calculator app I have on my iPad) agrees too: it claims that is about which has that magic 6,846,169 digits. One nagging little point about Friedrich’s work, though, is that you need to know the logarithm of 3 to work it out. (Also you need the logarithm of 10, or you could try using the common logarithm — the logarithm base ten — of 3 instead.) For finding the actual number that’s fine; trying to get this answer with any precision without looking up the logarithm of 3 is quirky if not crazy. But what if you want to do this purely by the joys of mental arithmetic? Could you work out without finding a table of logarithms? Obviously you can’t if you want a really precise answer, and here counts as precise, but could you at least get a good idea of how big a number it is? How Big Is This Number? I mentioned in a throwway bit in the article on Goldbach’s Odd Conjecture being (apparently) proven that the number had been a bound in the conjecture. That is, it was proven in 1939 that numbers larger than that had to obey the conjecture, but that it was unproven for numbers smaller than that. I described it as a number that tekes something like seven million digits to write out in full, that is, in a decimal expansion rather than some powers-of-powers sort of thing. So let me give it a little attention as a puzzle for people who want to pass a little time doing arithmetic. Am I right to say that would be a number with about seven million digits? The obvious way to check is to see what Google comes up with if you put 3^(3^(15)), although that turns out to be Bible quotes. Its calculator gives back Infinity, which here just means “it’s a really, really big number”. My Mac’s calculator function and my copy of Octave agree on that. It’s possible to find a better calculator that gives a meaningful answer, but you can work out roughly how big the number is just by hand, and for that matter, without resorting to anything you have to look up. I promise. Author Joseph NebusPosted on Saturday, 1 June, 2013 Categories Math, Mathematics, Maths, Puzzle, Recreational MathematicsTags arithmetic, goldbach, google, infinity, puzzle3 Comments on How Big Is This Number? I’ve been reading a book about the innovations of baseball so that’s probably why it’s on my mind. And this isn’t important and I don’t expect it to go anywhere, but it did cross my mind, so, why not give it 200 words where they won’t do any harm? Imagine one half-inning in a baseball game; imagine that there’s no substitutions or injuries or anything requiring the replacement of a batter. Also suppose there are none of those freak events like when a batter hits out of order and the other team doesn’t notice (or pretends not to notice), the sort of things which launch one into the wonderful and strange world of stuff baseball does because they did it that way in 1835 when everyone playing was striving to be a Gentleman. What’s the maximum number of runs that could be scored while still having at least one player not get a run? How Big Was West Jersey? A book I’d read about the history of New Jersey mentioned something usable for a real-world-based problem in fraction manipulation, for a class which was trying to get students back up to speed on arithmetic on their way into algebra. It required some setup to be usable, though. The point is a property sale from the 17th century, from George Hutcheson to Anthony Woodhouse, transferring “1/32 of 3/90 of 90/100 shares” of land in the province of West Jersey. There were a hundred shares in the province, so, the natural question to build is: how much land was transferred? The obvious question, to people who failed to pay attention to John T Cunningham’s This Is New Jersey in fourth grade, or who spent fourth grade not in New Jersey, or who didn’t encounter that one Isaac Asimov puzzle mystery (I won’t say which lest it spoil you), is: what’s West Jersey? That takes some historical context. Author Joseph NebusPosted on Wednesday, 12 December, 2012 Categories Education, Math, Mathematics, Maths, PuzzleTags education, history, homework, measurement, New JerseyLeave a comment on How Big Was West Jersey? My reposted problem of a couple days ago, about building all the digits of a clock face using exactly three 9’s and simple arithmetic combinations of them, caught in my mind, as these things will sometimes do. The original page missed out on a couple ways of using exactly three 9’s to make a 1, but it’s easy to do. The first thing to wonder about was how big a number could we make using exactly three 9’s? There must be some limit; it’d be absurd to think that we could make absolutely any positive integer with so primitive a tool set — surely 19,686 is out of the realm of attainability — but where is it? Did WiiFitPlus Make Things Worse? So here’s my homework problem: On the original WiiFit there were five activities for testing mental and physical agility, one of which I really disliked. Two of the five were chosen at random each day. On WiiFitPlus, there are two sets of five activities each, with one exercise drawn at random from the two disparate sets, each of which has a test I really dislike. Am I more likely under the WiiFit or under the WiiFitPlus routine to get a day with one of the tests I can’t stand? Here, my reasoning. Author Joseph NebusPosted on Friday, 24 August, 2012 Categories Mathematics, Maths, Probability, PuzzleTags gaming, probability, technology, wii, WiiFitLeave a comment on Did WiiFitPlus Make Things Worse? We got a WiiFit, and a Wii, for Christmas in 2008, and for me, at that time, it was just what I needed to lose an extraordinary amount of weight. As part of the daily weighing-in routine it offers a set of challenges to your mental and physical agility. This is a pair drawn from, in the original release, five exercises. One is the Balance Test, measuring whether you can shift a certain percentage of your weight to the left or right and hold it for three seconds; the balance board, used for each of these tests, measures how much of your weight is where, left or right, front or back of the board. One is the Steadiness Test, about how still you can stand for thirty seconds and is trickier than it looks. (Breathe slowly, is my advice.) One is the Single Leg balance Test, trying to keep your balance within a certain range of centered for thirty seconds (and the range narrows at ten, twenty, and twenty-five seconds in). One — the most fun — is the Agility Test, in which you swing your body forward and back, left and right to hit as many targets as possible. And the most agonizing of them is the Walking Test, which is simply to take twenty footfalls, left and right, and which reports back how incredibly far from balanced your walk is. The game almost shakes its head and sighs, at least, at how imbalanced I am. An interesting parallel’s struck me between nonexistent things and the dead: you can say anything you want about them. At least in United States law it’s not possible to libel the dead, since they can’t be hurt by any loss of reputation. That parallel doesn’t lead me anywhere obviously interesting, but I’ll take it anyway. At least it lets me start this discussion without too closely recapitulating the previous essay. The important thing is that at least in a logic class, if I say, “all the coins in this purse are my property”, as Lewis Carroll suggested, I’m asserting something I say is true without claiming that there are any coins in there. Further, I could also just as easily said “all the coins in this purse are not my property” and made as true a statement, as long as there aren’t any coins there. The modern interpretation of what we mean by a statement like “all unicorns are one-horned animals” is that we aren’t making the assertion that any unicorns exist. If any did happen to exist, sure, they’d be one-horned animals, if our proposition is true, but we’re reserving judgement about whether they do exist. If we don’t like the way the natural-language interpretation of the proposition leads us, we might be satisfied by saying it’s equivalent to saying, “there are no non-one-horned animals which are unicorns”, and that doesn’t feel quite like it claims unicorns exist. You might not even come away feeling there ought to be non-one-horned animals from that sentence alone. Midway through “What Lewis Carroll Says Exists That I Don’t” I put forth an example of claiming a property belongs to something which clearly doesn’t exist. The problem — and Carroll was writing this bit, in Symbolic Logic, at a time when it hadn’t reached the current conclusion — is about logical propositions. If you assert it to be true that, “All (something) have (a given property)”, are you making the assertion that the thing exists? Carroll gave the example of “All the sovereigns in that purse are made of gold” and “all the sovereigns in that purse are my property”, leading to the conclusion, “some of my property is made of gold”, and pointing out that if you put that syllogism up to anyone and asked if she thought you were asserting there were sovereigns in that purse, she’d say of course. Carroll has got the way normal people talk in normal conversations on his side here. Put that syllogism before anyone and point out that nowhere is it asserted that there are any coins in the purse and you’ll get a vaguely annoyed response, like when the last chapter of a murder cozy legalistically parses all the alibis until nothing makes sense. I’m sorry to go another day without following up the essay I meant to follow up, but it’s been a frantically busy week on a frantically busy month and something has to give somewhere. But before I return the Symbolic Logic book to the library — Project Gutenberg has the first part of it, but the second is soundly in copyright, I would expect (its first publication in a recognizable form was in the 1970s) — I wanted to pick some more stuff out of the second part. I mean to return to the subject brought up Monday, about the properties of things that don’t exist, since as BunnyHugger noted I cheated in talking briefly about what properties they have or don’t have. But I wanted to bring up a nice syllogism whose analysis I’d alluded to a couple weeks back, and which it turns out I’d remembered wrong, in details but not in substance. I borrowed from the library Symbolic Logic, a collection of an elementary textbook — intended for children, and more fun than usual because of that — on logic by Lewis Carroll, combined with notes and manuscript pages which William Warren Bartley III found toward the second volume in the series. The first part is particularly nice since it’s text that not only was finished in Carroll’s life but went through several editions so he could improve the unclear parts. In case I do get to teaching a new logic course I’ll have to plunder it for examples as well as for this rather nice visual representation Carroll used for sorting out what was implied by a set of propositions regard “All (something) are (something else)” and “Some (something) are (this)” and “No (something) are (whatnot)”. It’s not quite Venn diagrams, although you can see them from there. Oddly, Carroll apparently couldn’t; there’s a rather amusing bit in the second volume where Carroll makes Venn diagrams out to be silly because you can make them terribly complicated. The set of posts about the area of a trapezoid seems to form a nearly coherent enough whole that it seems worthwhile to make a convenient reference point so that people searching for “how do you find the area of a trapezoid in the most convoluted and over-explained way possible?” have convenient access to it all. So, this is the path of that whole discussion. How Many Trapezoids Can You Draw? All the popular mathematics blogs seem to challenge readers to come up with answers; I might as well try the same, so I can be disheartened by the responses. In a pair of earlier essays I talked about the problem of drawing differently-shaped trapezoids so as to not overlook figures that might be trapezoids just because the intuition focuses on one shape over others. So how many different shapes of trapezoids are there to draw? Let me lay out some ground rules. Author Joseph NebusPosted on Wednesday, 11 April, 2012 Categories Geometry, Math, PuzzleTags challenge, drawing, geometry, puzzle, trapezoid2 Comments on How Many Trapezoids Can You Draw?